We can't even count anymore as to how many women have contacted us about the continuing frustration they suffer from trying to clear up their acne problems. 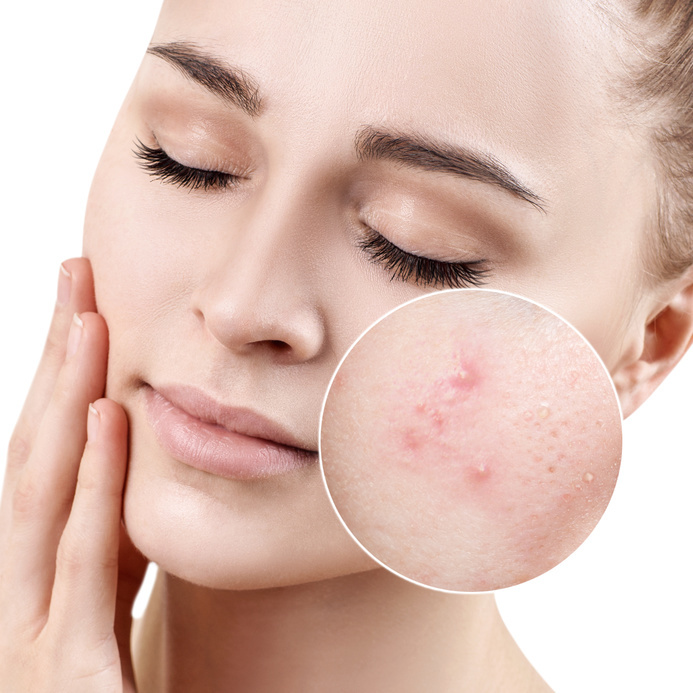 Acne has become an all too common experience for many, yet the advice they receive from commercials, estheticians, dermatologists, friends or family may not be the best advice. Unfortunately, because of that frustration, all too often these women have accepted what they are being told at face value, yet their skin screams, "this isn't working!" When we finally are able to speak with these women on the phone their emotion and pain are real and in many cases they are literally at their wits end. Plus, just when we may think we will never have acne or we will finally be rid of it as we get older, sadly we learn acne does not age discriminate and can occur at any time and at any age. Menopause can be factor for either the relief from acne or the onset of new bouts of acne due to hormonal changes within our skin. Testosterone levels are a key factor to sebum production and acne breakouts. So as our bodies adjust to the change we may experience skin conditions we may not have otherwise had. Commercial Promotions: Like any great marketing strategy a commercial promotes the acne product it wants us as a consumer to buy. It isn't necessarily a great acne product, or it may or may not work, but with all the hype surrounding the product, especially if it is endorsed by a person with the M.D. after their name, creates the illusion "it must work" so we buy it strictly from an emotional response brought about by desperation. Estheticians: They are in the business of skincare and they have been trained to address issues specifically targeting maladies of the skin which include acne. In many cases a good esthetician can literally know and understand more fully what is going on with your skin and can provide sound advice. However, again be cautious if along with the advice they push a certain product on clients, one they may not necessarily have seen absolute results with, but is the product their salon or spa carries and a commission is received for every product they sell. Friends and Family: They have nothing but good intentions at heart and we want nothing more than to believe what they tell us. Perhaps they had acne as a kid, but not as an adult or vice versa. Depending on the type of acne or how severe it is, can make a huge difference on how to treat it. Though their heart may be in the right place, what they did to treat their cystic acne may not actually be the best course to take today. Their acne may be completely cleared up, but at what expense to their skin, and if it isn't, you have to wonder if you can take their advice seriously. Dermatologists: They have the skilled knowledge of working with skin disorders and can bring about some relief for acne sufferers. However, many women shared their story with us and have seen their dermatologist only to still be suffering from the angst of acne, or endure continuing pain, or have ongoing issues unrelated to the acne and are more with the acne treatments themselves. In some cases this will literally cause more harm to their skin than the acne itself, including eroding self esteem. Women have confided in us how their dermatologist actually bullied them into using a product with an attitude of knowing it would dry out their skin worse, but at least the acne will be gone. This type of dermatologist will only be concerned with clearing up the acne, which will result in poor outcome for overall soothing and healing of the skin in its entirety, and will not provide patient support to the underlying emotions behind the affliction. In some cases, they will promote a particular line of skincare products with the same harsh ingredients which contribute to more dryness or irritation. If you have an intimidating doctor, seek help elsewhere. Mutual respect is a must for both patient and doctor, and life is too short to deal with a doctor whom lacks empathy. Acne is not something we should attack because when it is approached in this manner the results will be less than favorable. Yes acne is not attractive, but it is a tender issue for skin and something which should be treated gently to mitigate as little damage as one can. Using products which dry up the acne will also dry out your skin terribly. Then the skin tries to compensate by producing more oil (sebum). The irony of this; overproduction of sebum is the very thing which clogs pores and feeds the bacteria which causes acne in the first place. In this environment Propionibacterium Acnes will proliferate and then explode into the onset of cystic acne. This form is very painful and can and will leave scarring in it's wake! What also contributes to the raging battle on the skin is the use of drying ingredients combined with moisturizing ingredients. The skin literally fights itself, trying to compensate for all the different chemicals being used to correct one thing while destroying another. This is insanity and makes absolutely no sense to continue with this tactic of fighting facial acne. In fact to quote Einstein, "insanity is doing the same thing over and over again but expecting different results." Face produces oil - oil attracts dirt and debris and plugs pores - oil feeds bacteria - acne breaks out - you use products to dry up acne and remove excess oil - face produces more oil - attracts more dirt and debris and plugs pores - oil feeds rapidly growing bacteria - more acne breaks out - you use more products to dry up acne and remove excess oil - infinity! In most cases women with oily skin avoid moisturizers which is a very bad idea. Instead they use a moisturizer with synthetic emollients or the wrong type of emollients, thinking this is all they can use. Yet certain emollients contribute to more occlusion of pores and can actually further contribute to enhancing dry patches on the face. Product labels which state "oil free" are not necessarily oil free, but are comprised of silicone oils. So the connotation really means by definition, doesn't contain mineral oil or other petroleum based emollients. But due to this labeling practice, it has many acne sufferers afraid of anything "oil." Bottom line, silicone oils of dimethicone and cyclomethicone and their derivatives are a synthetic oil and do not moisturize. Any ingredient name incorporating in part, the word "Siloxanes" is also considered part of the dimethicone / cyclomethicone family. All of these are actually designed to trap moisture against skin which is not sustainable unless other moisturizing properties are utilized. Typically this type of product contains a fatty acid and alcohol derivative profile which can be considered a surfactant and / or an emollient, but should not be confused as it having moisturizing properties. In terms of a "synthetic emollient", these are utilized to give skin a soft feel only and prevent further dehydration of the skin. They are basically used in the skincare formula for locking moisture against the skin after washing the face. So you are essentially sealing your skin with a thin oily, slick coating of Saran Wrap. The results are typically more acne! Important to note that once the product containing a silicone derivative is applied to the skin it will certainly create a velvety, silken feel but it will be a dry residue, so applying another moisturizer over the top will do nothing now that the skin has been sealed. This can also prevent mineral makeup products from properly adhering to the face due to this drier, non moisturizing texture on the skin, giving a less than desirable finish.